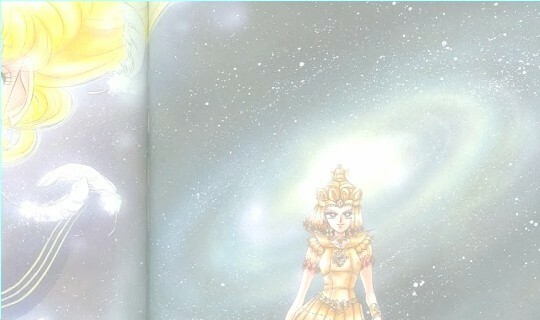 Michiru Keioh has to be the artist of the Senshi. Michiru’s violin could soothe any one’s ears and break hearts. A $4 Million violin named “The Marine Cathedral” not only brings out Michiru’s true talent but also serves as a weapon. Michiru comes off as a snob some times but it’s all in good measure. She’s careful of who she trusts and, like Haruka, tends to pull away from others. She is bitter toward the Inner Senshi. They are carefree and joyful, she is not. But in the end she is a kind loving woman that is just trying to do the right thing. Haruka and Michiru share a passion like Bunny and Darien do. They are very much in love and share the relationship problems that most of us do. They, like Bunny and Darien, are not only soul mates, they're also a team. One thing that annoys Michiru about the relationship is Haruka scaring off all her fans. Sailor Neptune appears before the inner Senshi, knowing of the pending evil. As does Sailor Uranus. Sailor Uranus and Sailor Neptune don't want to be part of the Senshi, they just want to complete the mission that they were given. They were given the mission to prevent the awakening of Sailor Saturn, the Senshi of Destruction, the bringer of death and the end of the world. They also feel betrayed from their former lives. They were kept exiled while the Inner Senshi enjoyed life. Sailor Neptune’s attacks have to deal mainly with the ocean or her violin. Many people now, who haven’t read the part of the series where Neptune enters gets confused. “I though that Amy/Mercury was the water senshi.” Yes, Amy is the water Senshi, but Michiru is the Deep Sea senshi. Michiru’s most important role is that of Mom. She has to take on the role of mother when Saturn is reborn as a baby. Michiru grows to love Hotaru when she is a baby. She doesn’t blame her for some of the things she does, like breaking her Royal Copenhagen dishes. Besides Hotaru is the senshi of destruction. Michiru decides to exercise Hotaru’s mind by allowing her to read all the books in the library and by teaching her to play the violin.